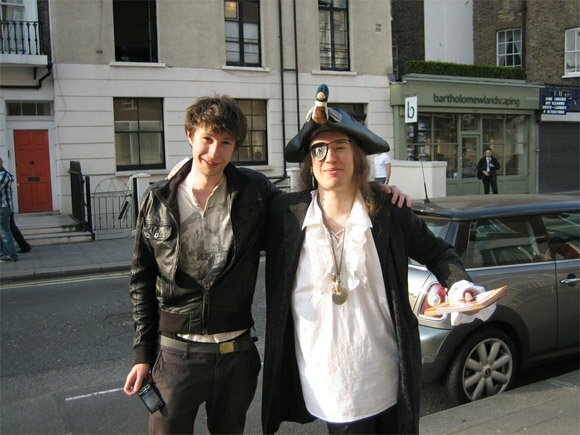 A Pirate Party UK candidate standing for election to Parliament in London is facing a deadly duel - against a fancy dress Pirate calling himself Mad Cap'n Tom. The Pirate-on-Pirate action is taking place in the Cities of London and Westminster constituency, which covers the seat of government. The anti-copyright candidate is 24-year-old Jack Nunn, to whom we are grateful for getting in touch to point out the confusion. Without his email, we wouldn't have noticed it. He's up against comedian Tom Scott, who has changed his name for the event, and who dresses like a pirate. He also talks, and blogs, in character. Cap'n Tom's policies include removing duty from rum, free duct tape for every household, and requiring schoolchildren to be trained in swordsmanship an' gunnery. Referring to his manifesto, Cap'n Tom says: "I believe the promises within t'be as reasonable an' realistic as many of the others made in modern politics." I am standing for the Pirate Party UK - which is an international civil rights and human rights movement. In the same constituency a man is standing as a joke candidate as a pirate, but there seems to be some confusion surrounding the two candidates. I think it has a gentle humour to it, yet it polarises the candidates. We are a serious party with serious issues, not a fancy dress party. So far it's the Fancy Dress candidate who has captured the imagination, however. Cap'n Tom has over 4,000 Facebook supporters and has been namechecked on primetime BBC TV, Radio 4 and the Daily Express. It's an uphill battle for the freetard's choice, then. But all novelty fades in the end: the original Swedish Pirate Party has seen membership halve in a year, and the UK copycat PPUK is over £3,000 short of the £10,000 it wanted to cover its General Election expenses. *Not really. 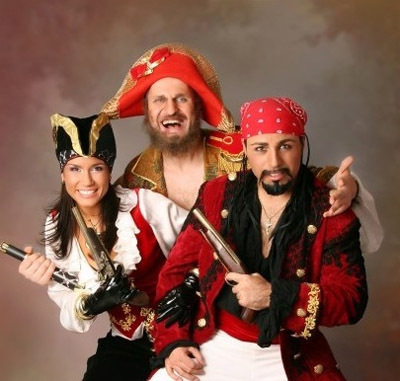 This of course actually be Pirates of the Sea, Latvia's 2008 Eurovision entry, who finished 12th, with a larger share of the vote than the Pirate Party are likely to win. Here are the real duelling pirates, courtesy of the Cap'n's blog. Jack Nunn is on the left, we think.